One way the Soviet Union tried to popularize major initiatives and programs was with government-issued stamps. Stamps reached nearly every person in every household and thereby served as a powerful means of advertising official programs and celebrating national achievements. This Soviet practice continued a tradition of the tsarist period, when Russian stamps featured projects in exploration and the personalities associated with them. In the first decades of the Soviet era, beginning in 1917, stamps often featured major development projects or prominent scientists and artists. 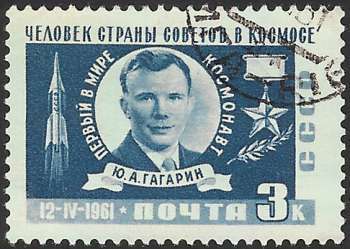 At the dawn of the space age, the Ministry of Communications (which included telephone, telegraph, and the post) chose stamps with themes that honored Soviet activities in space. This stamp celebrates the first flight of a human into space. On April 12, 1961, Yuri Gagarin made a single orbit of the Earth on board the Vostok spacecraft. The Soviets carefully managed public announcements of his flight, including issuance of the stamp in 1961. After Gagarin returned from space, he immediately began a goodwill tour that spread the word of his flight and Soviet successes throughout the world. His spacecraft and its capabilities, however, remained shrouded in mystery. After the flight, the Soviet government chose to reveal a few technical details, as part of its active publicizing and promotion of Gagarin's mission.